Where do I use my Cruise Nation voucher code? Cruise Nation provide cruises to some of the most impressive locations on earth including the Mediterranean, the Caribbean, the Far East, the Norwegian Fjords, the Transatlantic, the Canary Islands, Alaska, Dubai and the Emirates, the USA , South America, Canada, the Indian Ocean, the South Pacific, Hawaii, Africa, Australia, New Zealand and many more. They also provide multiple cruises and stay options in places like Athens, Barcelona, Cape Town, Chicago, Hong Kong, Lake Como, Las Vegas, LA, New York, Rome, Sydney, Venice and Sri Lanka. If you’re looking for a cruise holiday you can discover all different types of cruise holidays including all-inclusive cruises, festive cruises, family cruises, fly cruises, honeymoon cruises, luxury cruises and mini cruises. All of Cruise Nations’ cruises and cruise holidays are partnered with only the best cruise lines, airlines and hotel providers. Some of the cruise lines Cruise Nation work with include: Azamara Club Cruises, Carnival Cruise Lines, Celebrity Cruises, Costa Cruises, Cruise & Maritime, Cunard, Holland America, MSC Cruises, Norwegian Cruise Line, Oceania, P&O Cruises, Princess Cruises, Royal Caribbean and Regent Seven Seas. All of Cruise Nation’s holidays and cruises are 100% ATOL protected so you can book with absolute confidence that you’re paying an affordable price and are travelling with a brand you can trust. As well as providing cruises and cruise holidays Cruise Nation also offer shore excursions with up to 50% off, so not only can you enjoy an excellent experience on board, you can also make memories to last a lifetime once you’re on shore too. All of Cruise Nations’ excursions are provided at prices lower than most cruise lines offer, they guarantee to get you back to your ship on time and provide a refund if your ship doesn't port for any reason. All the tours and excursions provided are led by professional, English-speaking tour guides and are available in every destination you dock at. Discover group tours, tours and excursions in the British Isles, the most popular tours, tours of Italy and much more, all of which are extremely affordable and incredibly worthwhile. If you’re looking for extra information, inspiration or holiday tips from previous customers then check out the Cruise Nation blog. Here you can discover hundreds of articles and posts about cruises and destinations all over the world. Find posts on the port of the month, the cruise of the month, the top romantic summer getaways, the best Caribbean Islands, understanding different board basis’ and much, much more. With new posts added every week you can find new information and travel tips regularly and can enjoy exclusive pictures from all the destinations and cruise lines provided by Cruise Nation. If you’re looking to save money on your cruise holiday then check out the deals section at Cruise Nation. They offer deals on cruises departing this and next as well as Christmas cruises, new year cruises, mini cruises and cruises from the UK. As well as this you can also save on smart packages, all inclusive cruises, cruise and stay holidays, no-fly cruises, last minute cruises, exclusive packages, family cruises, luxury cruises, Club 30 cruises and fly cruises. If you’re looking to travel last minute then check out the last minute deals available with Cruise Nation. These last minute cruises travel from Southampton, the Mediterranean, the Caribbean and Norway. If you can’t find what you’re looking for then use the Cruise Nation deal nerd. The deal nerd will browse through and find a cruise package to your chosen destination on the date of your choosing at the best possible price. The holiday balance payment that is due and shown on your confirmation invoice, must be sent by at least 16 weeks before your date of departure. If you make a booking less than 16 weeks before the departure date, then full payment of the holiday costs and any applicable insurance premiums or booking fees must be made at the time of booking. Please note that late bookings may also incur a late booking fee of which you will be advised at the time of booking. The nearer the cancellation is to your departure date then the greater the cancellation charges will be. Please note your cancellation can only be accepted if it is in writing from the lead name on the booking. Cancellation will be effective from the date it is received. Please note that in the event of cancellation no insurance premium or booking fee will be refunded. Please note that a cancellation made within 35 days incurs a 100% cancellation fee. Cruise Nation works closely with many cruise lines, airlines and hotels to build you a fully ATOL protected cruise package holiday that includes your cruise, flights and free stays in some of the most amazing destinations on the earth. Voted the UK’s number 1 cruise holiday company, with Cruise Nation you can save between 30% - 70% on your cruise package. All of the cruise holidays offered by Cruise Nation include free stays so you get to discover your destination beforehand and are all fully ATOL protected. 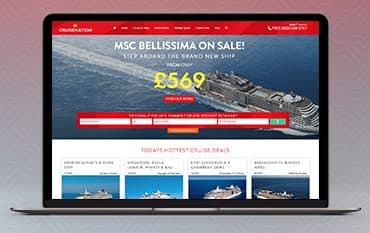 Book your cruise holiday online with Cruise Nation and use a discount code from us to save as much as possible on your getaway. We are constantly on the hunt for Promo Codes for Cruise Nation to help you with your money saving. Our experts check dozens of sites for secret codes including NHS discounts, student sites & social media channels saving you time & money!